LCC's Cicero On-Demand streamlines the process of creating annotated indexes from collections of text in English, Chinese, Arabic, and other languages, though an easily accessible RESTful API. LCC provides On-Demand as software for purchase as well as a hosted software-as-a-service option available on request. When faced with terabytes of text, information consumers need robust tools that will allow for the annotation of large amounts of data in a reasonable amount of time. LCC's Cicero On-Demand delivers the high-performance indexing capabilities needed to unlock value from even the largest of corpora. Users can interact with Cicero On-Demand's built in file browser to select the documents that should be added (or removed) from an existing index. In addition to providing preprocessing capabilities for HTML, SGML, XML, PDF, RTF, and Microsoft Word documents, Cicero On-Demand includes built-in WWW harvesting engines which make it easy to download web content or to interface with popular search engines. Cicero On-Demand provides access to the state-of-the-art search and filtering capabilities provided by LCC's Ferret and CiceroCustom products. With Cicero On-Demand, users can specify the amount of information that should be associated with an index. Need to create indexes quickly for CiceroCustom or Ferret? Cicero On-Demand's "light" mode can process documents at nearly 80 KB/s using standard hardware. Need access to even information available from CiceroCustom extractors? Cicero On-Demand's "full" indexing mode annotates documents with speeds up to 25 KB/s. Cicero On-Demand makes it easy to distribute the creation of indexes across networked machines. With one simple interface, users can monitor the progress of indexing, start (or stop) indexing on remote hosts, or even schedule indexing to begin at a later time or date. Cicero On-Demand also simplifies the process of adding new annotations (or documents) to an existing index. Unlike other available annotation tools. there's no need to re-annotate entire indexes: users can simply "update" indexes with just the annotations they need more. Cicero On-Demand is accessible through an easy-to-use, platform independent RESTful API. See the API documentation for more details. A Java API is also available. LCC's Cicero On-Demand was designed to run on standard hardware. Have questions about whether it'll run in your environment? E-mail us at support@languagecomputer.com. Cicero On-Demand is available for English, Arabic, Chinese, and other language documents. On-Demand NLP currently processes a wide range of file formats, including Microsoft Word (.doc, .docx), Microsoft Excel (.xls, .xlsx), Microsoft PowerPoint (.ppt, .pptx), XML, PDF, HTML, RTF, and plain text files. 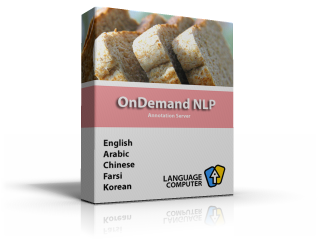 For more information about On-Demand NLP, call our product support team at (972) 231-0052, or e-mail us at support@languagecomputer.com.